Back when no-one really knew what memes meant and we didn’t need flash or even captions to keep us entertained for hours, the hampster dance was like one of the best things on the internet. 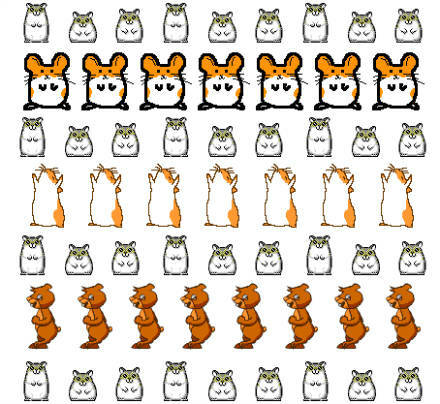 The page was just several rows of hamsters and some other rodents (as animated GIFs) dancing to the dubious sounds of a speeded-up version of “Whistle Stop” by Roger Miller. It was created by Canadian art student Deidre LaCarte for a Geocities page. Arguably the original meme. A must-watch for hamster lovers. That mushroom? Where did it come from? Comical duo from the same meme-house as Badger Badger, best punchline: “Jelly is not porous”. Caturday started out as a day to post pictures of cats, though now eclipsed by its mighty progeny Lolcats – it’s a classic early-form meme. It’s actually a praire dog. But in that wide-eyed stare there’s something universal.